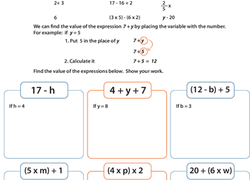 Get your first taste of algebraic expressions with this introduction page. Your student will practise translating written phrases into algebraic equations. Getting dizzy over decimals? This worksheet focuses on writing decimals in expanded form using fractions. Give your fifth grader some practise with variables on this simple algebra worksheet where she'll get to find the value of the expression. 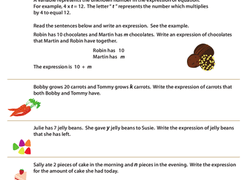 Introduce your fifth grader to variables with this simple algebra worksheet. Give your fifth-grader some practise multiplying and dividing with variables on this simple worksheet. Got a maths whiz on your hands? Give him some supplemental work practising writing decimal numbers in expanded form. Your fifth grader will have a fun time figuring out Ricky's reward with this algebra worksheet.